Exeter coach Ali Hepher has said the returning international players will have to work hard to displace those currently in the side. 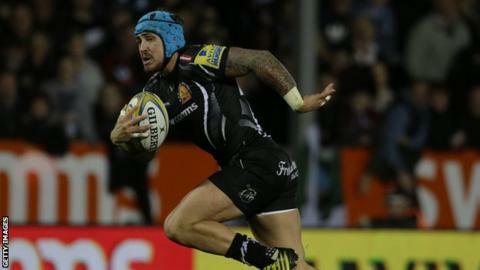 Saturday's squad included England's Jack Nowell, Henry Slade and Geoff Parling and Welsh prop Tomas Francis. Though Nowell scored two tries in the Exiles' 38-11 win over London Irish, Hepher said the 22-year-old knows his place in the side is not guaranteed. "We have got quality depth this year," he told BBC Sport. "They're all quality guys and were desperate to get back here. "As Jack Nowell said, he knows how he has to perform having seen how the boys have performed in pre-season. "He's well aware if his levels drops there are plenty of guys who can step into his boots. "Nowell's come back and put in a hell of a shift, all four guys did."